Well, I did it! I managed to finish my first half marathon and I didn’t get swept! 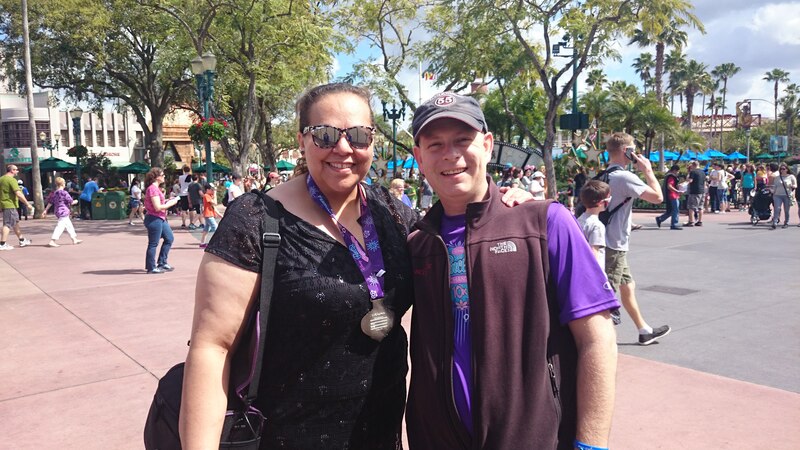 It wasn’t pretty, I made so many mistakes, but I did it and now I was hobbling my way back to the bus that would take me back to Coronado Springs. Shari tried to wait for me to finish (she finished around 45 minutes before me) but they wouldn’t let her hang out near the finish line so she headed back to the room. Unfortunately Cynthia got swept at mile 8 but she was ok with it! She did really well considering this was the first race she’d ever done! She knows she can do a 5k or 10k now, but she was proud of how far she got! I was super proud of her too! Once I got back to Coronado Springs, it hurt like hell to walk…or sit…or stand back up…or walk… You get the picture. My blister was enormous and I knew it was better not to pop it since we were going to go to Hollywood Studios and have lunch at Sci-Fi Dine In Theater. I changed, stretched a little and we all headed to the bus stop to make our way to the park. But before we ate, I got a phone call from my mom. I remember this phone call vividly. I answered thinking my mom was just calling to see how the race went. And although she did ask about the race, her main reason for the call was to let me know she got an email that my flight for the next morning was cancelled due to an ice storm in Dallas. My mom booked my airline tickets for me and used her email address, so they sent the cancellation notice to her. It’s a good thing though, because when we got the Magical Express info at our room that morning the time for my pick up was not listed. I thought that because I’d scheduled Disney’s Magical Express so closely to when my trip was that the info just never got entered or something so I’d decided to figure it out later that evening. I freaked out for a moment. This was not an ideal situation. My mom was going to have to work from her end to get me on another flight mostly because my phone service at Disney World is always hit or miss and I needed to work on getting a new flight ASAP. She told me she’d call the airline to get my new flight booked. I tried not to worry about it and went to have our meal at Sci-Fi. I love Sci-Fi Dine in Theater! It’s fun, it looks cool…the food is good in my opinion. But then again, I’m not a foodie and I just ordered a burger and fries… But it was yummy! The fact that I was tired, hurting, and worried about my flight situation made me not have as much fun here this time as I could have. I was ready to go back to our room. Shari and Cynthia weren’t really ready to go back to the room so they did their own thing and I headed back to Coronado Springs. I’d already contacted my travel agent friends Tina and Don with Destinations With Character and asked them to find me a room at the value resorts just in case I had to spend an extra night at Disney World. By the time I got back to our room, my mom had messaged me to let me know the first flight she could get me on was on Wednesday morning. WHAT??? Crap. I’d only made plans for my kids and for missing work through Monday. Now I had to make arrangements for my mom and dad to help with my kids until Wednesday and I had to leave my job short handed for 2 extra days. I ended up talking to my mom on the phone and she let me know she’d make it work with getting my kids to school and all. I contacted one of my bosses and let her know I was stuck at Disney and wouldn’t be back at work until Thursday. Tina and Don had a room reservation on standby for me and they got me booked quickly and easily once I told them I was stuck at Disney until my flight on Wednesday. I did some more stretching and decided to try to nap. All I kept thinking about was how I couldn’t believe I was stuck here for 2 extra days. But then I was like “Wait…this really isn’t that bad. I’m stuck. At DISNEY!” My kids are still being taken care of and I had another flight booked. O.M.G. I’m stuck at Disney World! This is the best bad news ever! I didn’t go back to any of the parks the rest of the day. We all had to get our stuff packed because we all had to leave Coronado Springs the next morning. Cynthia and Shari would be flying home, but I was going to have an extended, and unexpected, stay at the Most Magical Place on Earth! 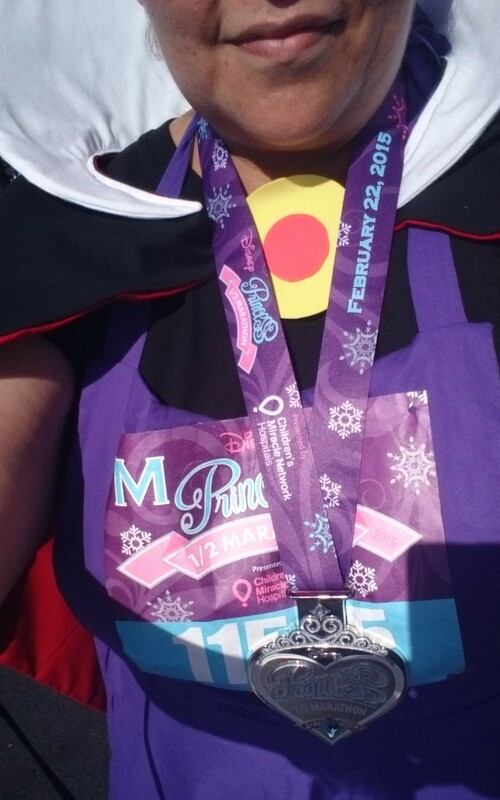 Posted by Shandale on May 6, 2015 in Running and RunDIsney, The Daily Post and tagged Disney, Disney Blog, Disney Magic, Disney obsession, Disney Parks, Disney Trip Report, Disney Vacation, Disney World, Disney World Trip, Disney's Hollywood Studios, Epcot, Magic Kingdom, Princess Half Marathon, Random, RunDisney, Running, Solo trip, Walt Disney World, WDW, YouTube channel.